Thinking About Leaving a Missing Tooth? Consider Dental Implants In Fresno! Did you know that an estimated 120 million people in the U.S. have lost at least one tooth? Many people think that missing a tooth isn’t a big deal, especially if it’s in the back and doesn’t show when they smile. But there are several surprising consequences to leaving an “empty space” that impact your overall oral health and self-confidence. In fact, even missing just one tooth causes other problems that cost you more time and money to fix down the road. Learn more below about the importance of having a full complement of teeth and why dental implants in Fresno are a great option for restoring your smile! How Can a Missing Tooth Cause Other Problems? Over time, your jaws will lose bone mass and begin to shrink, causing your facial structure to change and adding years to your appearance. Any teeth that are behind the missing space will begin to shift, move, or tip forward to “fill” the space. This leads to changes in your bite and also increases the risk of cavities and gum disease for the remaining teeth. You may not think about it, but you use every tooth to eat and speak comfortably. Chewing hard, tough foods and articulating words becomes more difficult after tooth loss. Fortunately, there are some fantastic modern replacement options that can help you avoid all of these issues! For many patients, dental implants are an ideal choice because they look and feel like natural teeth. 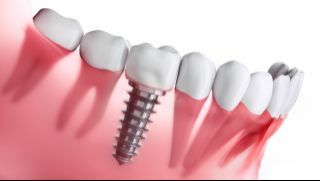 That’s due to one key difference: Unlike bridges and dentures, implants replace the root of a missing tooth. This tricks your body into thinking that a healthy tooth is still present, so you won’t lose bone mass in your jaws. It also provides unmatched stability and chewing strength. Another advantage of implants is that they last many decades with basic care and maintenance. This is much longer than other options and makes implants a wonderful long-term investment. Everyone needs all of their teeth to have great oral health. With dental implants, you can look forward to a healthy smile for life! With over 25 years of experience as a general and implant dentist in Fresno, Dr. Byron Reintjes is thrilled to offer an outstanding option like implants to restore his patients’ smiles after tooth loss. He knows that they’re the next best thing to natural teeth and loves seeing the self-confidence his patients have after treatment. If you have any additional questions, he can be reached via his website or at (559) 438-6684. Comments Off on Thinking About Leaving a Missing Tooth? Consider Dental Implants In Fresno!